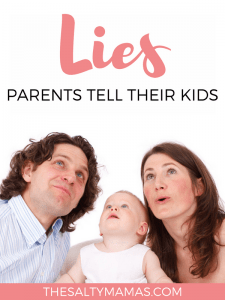 We’re gonna go ahead and put it out there- parents lie to their kids all the time. Like, ALL the time. 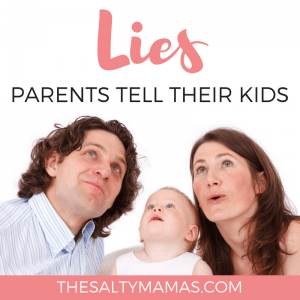 The lies we tell our kids range from the big and widely accepted (we’re looking at you, Santa) to the small and overused (“we’re leaving soon!”). But either way? Yeah, #SorryNotSorry. Not even a little bit. So now, in no particular order, we present to you the lies we tell our kids on a regular basis. Abram got no fewer than 8 light up, noise-making, move-on-their-own toys for his second birthday. So imagine my dismay when we ran out of batteries on the very same day. What are the odds? Coincidentally, the TV only gets power between the hours of 12 and 2 (which, bizarrely, happens to be the exact same time as Abe’s nap). Too bad we don’t have batteries for that either! Whether it’s Chuck E Cheese on a Saturday, or the beach basically always, it’s closed today. Usually on days when I just can’t stomach the thought of managing my kids at a given place. I may or may not be up to it tomorrow, but all I know for sure is NOT TODAY. It doesn’t matter what day of the week it is, or whether it’s the kind of thing that actually closes. What matters is that my kids don’t know that, so it’s CLOSED. . This is the only one that we actually believe is true while we’re saying it. Usually it’s uttered during a sibling squabble, or when one of the kids start to head towards the door, or when someone says they’re hungry. But then they rally, or we get into a conversation with a fellow MomSquad member, or the fight dissolves into happy giggles. And then those two minutes stretch to ten, or twenty, or sixty. We hold ourselves completely responsible for our kids’ complete lack of understanding of how time works. Christine knows a parent who has a popsicle every day at lunchtime, and their kids don’t even ask for one. You see, he has them trained to believe that this popsicle is full of icky medicine, and the kids have accepted it as truth. I once told Lila the brownie I was eating was made of poop so she would leave it alone, but after 14 minutes of her screaming, “I want to eat poooooooooop,”I abandoned the tactic. Now I tell her everything is made of wine, so she just thinks I’m a lush instead. We arbitrarily assign an age to something we don’t want the kids to do right this minute, and then we have to enforce it for the next five years or so. So Lila got a pack of gum for her fifth birthday, and will go to the arcade at the mall the day she turns 7. Same goes for that super-expensive lip balm kit that you have to be 8 to buy, or the area of the library that you have to be 12 to go into. The idea of letting our kids do these things seems so incomprehensible that we have absolutely no choice butbut push it out into the future. Hopefully way, way into the future. This is my FAVORITE trick to get the kids to bed, and I’m dreading the day they can actually tell time and call me on it. When I am so over the day, I’ll make a big show of gasping and saying, “Oh my gosh, it is WAY past your bedtime! I can’t believe I let you stay up so late…please don’t tell anyone I let you stay up until MIDNIGHT.” They typically go wide eyed, promise to keep it to themselves, and giggle their way into their jammies and out of sight. Never mind that it’s only 6:45 pm. They think they got away with something CRAZY, and I get away with a shockingly early bedtime. 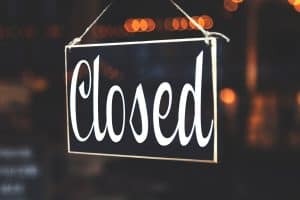 Whenever my kids have to miss something- whether it’s due to a scheduling conflict, or my kids don’t feel well, or because I just can’t face another birthday party with two feral kids– it never ceases to amaze me that the Birthday Boy or Girl just so happens to fall ill and the party gets cancelled. Such a shame, since we were all looking forward to it, but you can’t hold a party without the guest of honor. We have a long talk about how not to bring up the party in front of the poor, sick host (because it’s clearly a sore subject), take a minute to mourn the loss, and move on with our day. I don’t know how many times I’ve said this to my kids, but I do know that it is rooted in absolutely no science whatsoever. My daughter ate approximately half a string cheese and two toddler muffins between the ages of 1 1/2 and 2, and she STILL grew. But I think somewhere in our hearts, we wish- at least a bit!- that this was true, so we could keep these kids little, for just a little while longer. So we say it, and hope that saying it will succeed in stopping that rapid development in its tracks. All parents lie to their kids sometimes….We happen to do it a lot. But we think that you’ll agree that the reasons we’ve given are very sound. At the very least, they are for sure worth it. How about you? 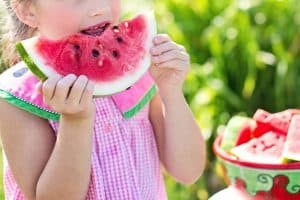 What little lies do YOU tell your kids? Drop them in the comments below! Omg Caillou is ALWAYS sick. He is the worst, and you are a genius. I am looking forward to the day that my children are old enough to understand reason and I can start telling them all sorts of lies in order to get them to bend to my will. Muahaha. I always told the kids it was in the motherhood handbook that’s why!